The cast of One Day At A Time: (clockwise from top) Rita Moreno; Marcel Ruiz; Justina Machado; and Isabella Gomez. There are not enough superlatives to describe Rita Moreno. 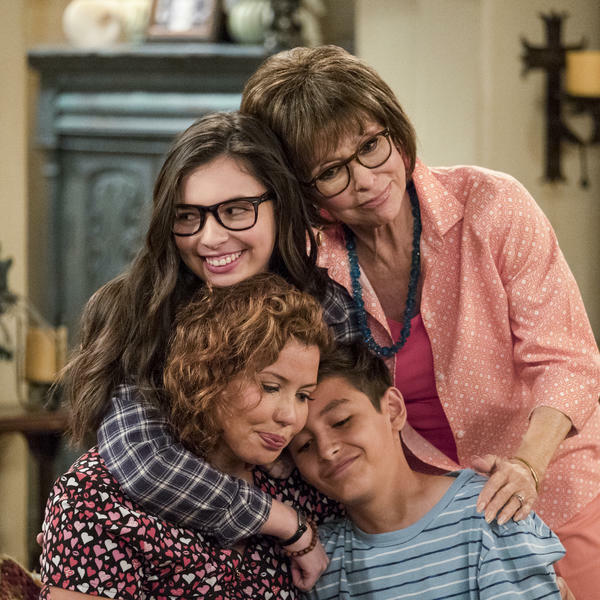 At an age when most are well past their most productive years, the Puerto Rico-born Moreno just completed the second season of Netflix's One Day At A Time. If you haven't seen the series yet, it's a remake of the popular sitcom that ran on CBS from 1975-84. The single mom and two children framework of the original has been reconfigured as a single Cuban-American mom and her two wacky and mischievous kids (one son, one daughter). Rita Moreno plays the family's "Abuelita." I spoke with Moreno about One Day At A Time (which you can binge watch on Netflix now). Our interview can be heard in its entirety in the latest edition of our Alt.Latino podcast. The transcript below has been edited for clarity. Felix Contreras: The last time you were here, you had just released a new album. And now you are here with the second season of a new Netflix series, One Day At A Time. You know, I think people would be OK if you decided to take it easy now and not work so hard. Rita Moreno: No way!! No no no no no! Listen, It's the difference between not liking what you do and loving what you do. I love what I do. If somebody took this away from me now I would be heartbroken. I love what I do. One Day At A Time is a remake of a sitcom that ran from 1975 to 1984. It was a story about a divorced mom raising two teenage daughters and has been reset with a Cuban-American family: a divorced mom, a teenage son and a teenage daughter. And Lydia, or "Abuelita." That is your character on the show. And I adore her! I love playing her. I get the accent from my mommy, but the rest of the character is really truly the invention of these astonishing writers! One is Cuban-American, that's Gloria Calderon Kellett, and she wrote for How I Met Your Mother, and the other one is Mike Royce from one of my favorite shows that I watch on repeats all the time, Everybody Loves Raymond. So we have fantastic writers plus a spectacular producer, Norman Lear. The original show on CBS ran for nine years with an all-white cast, a wonderful funny show but now it's about a Cuban-American woman with a Cuban mommy who came from Cuba who is not the easiest person in the world to get along with. That's what makes her so funny! I think Lydia is the comedic heart and soul of the show, the spirit and the togetherness of the family. And I'm wondering ... how much of an input do you have in this story in regards to the character development and some of the lines that you have in the show? I would love to say that I make up some of those lines! But no, they're not mine. They belong to the writers. Once in a while I come up with things like "Holy caca! That woman is really very ugly!" That's mine. But most of the time it's them. They understand this character. The one thing that's comes strictly from me is that when I was first asked to do the part of Lydia I remember having a conference call with Norman and (writers) Gloria and Mike the head writers and I said "Well I have one request and if that can't be met I'm not sure that I want to do this." And I said "I know she's 77 years old, but I want her to be a sexual being!" And both of the writers whooped, "Oh great! We love that!' And, boy, have they taken advantage of that! She's shameless! I mean she flirts with her daughter's boyfriend! She's shameless and I love that about her because I'm 86 years old, in real life, and I'm playing a character that is 77. And it reminds people that simply because people are old or older that you don't just suddenly turn to dust because you can no longer conceive. You're still a sensual person. And I love playing that part of her. Your character is a complex person, to say the least. The interesting thing about my character is that the negative aspects of her personality are so funny. Normally, the negatives about a character makes you dislike them and hate them. And while people may not agree with Lydia, they love her, they love her directness and her bluntness. I love it. 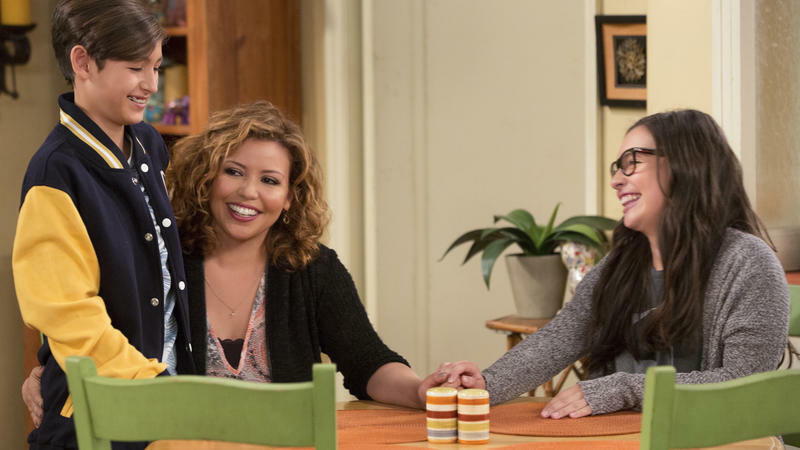 For example when Penelope [the show's single mom, played by Justina Machado] introduces her new boyfriend to my character Lydia for the first time, I say "He is a stallion!" I mean how would you feel if your mother was saying that?? Let's talk about your co-star, Justina Machado. She never ceases to amaze me. She is probably one of the best acting partners I've ever had in my experience. Really. I don't say that lightly, but she knocked me out. And I will use every opportunity whenever I can to talk about her and her great, great talent. And I mean, this is a couple of Emmys waiting to happen. That's the way I see it. [But] that doesn't mean as much as the fact that this woman is insanely crazy talented. She can be very funny and make you pee! And then she switches on a dime and she can make you weep. And that, you know, that's not an easy kind of talent. It's a very rare kind of talent. And I respect and admire her and don't think I haven't learned things from her as an actress. There's a little chink in Lydia's armor in the episode where race comes up, and she's insistent that the Cuban heritage that they share is European and not necessarily black. Honestly, I was so thrilled when we find that Lydia is more than a little bit racist because she's saying "We all come from Spain and you know Spanish people have fair skin." Then her daughter Penelope says "Oh, come on Mommy! You know very well that we come in all colors!' Then Lydia says "Yes ... but mostly we're white!" It's funny, but it makes a point. That whole episode is about racial bias and the fact that Elena doesn't get the brunt of that kind of bias because she's fair, and her brother is a kind of a copper color. And we find out, to maybe a little bit of our dismay, that Abuelita would much prefer to be thought of as white. I think that's very important because this exists all the time. And it exists in all nationalities and it's something that's not seen, or very rarely portrayed. So, just so that people will know what to expect from One Day At A Time, but without giving anything away ... you deal with veterans issues because Penelope, the mom, is an Afghan war veteran. There is an episode about immigration and a deportation that takes a dramatic turn in the show. And there are LGBTQ issues, too. We really deal with real life issues and then we make them outrageously funny and deeply, profoundly touching sometimes. One of my big shocks when I did the first season was the third episode, which remains one of my favorites, when we take on whether god exists or not. Do you remember that? It was astonishing. I remember reading that script turning the pages saying "Oh my god, I'm so happy to be with a place like Netflix where you can do this!" My on-screen daughter Penelope doesn't believe in god. My character... her room is filled with the pictures of the pope and all kinds of stuff. When my character says, " I'll tell you why. Because every single day that you were in Afghanistan I was at church every day and I begged him to bring you back alive!" It's very moving. And that doesn't necessarily convince Penelope. Penelope understands that you have to give people their due. And if they believe or they don't believe, it's not for you to judge. When I delivered those lines and defended the existence of god, Norman Lear had tears in his eyes and he says "Well, you convinced me!" and that was wonderful. I felt so good about that. It's an astonishing episode. That's right about the time early on in the show when you began to say, "Oh, wait a minute — this is not the usual!" You know my reaction? I'm very excited by it, and I'm scared to death. I'm very nervous about it. I love his work. I think he's a brilliant director. Here's the thing: If it's going to be a contemporary version of West Side Story, you're going to have to have rap and if you're going to have rap, what does that do to the songs? Do they use the songs? Do they not use the songs? And what in fact if you do rap are you going to do about the dances? Because the choreography has to change to. It may be a completely new West Side Story. And in a way I almost hope it is, because I don't want anybody messing with that. The fabulous choreography and-- yes, it had a lot of corny stuff that really needed help, then things that made me angry and that were wrong. And the makeup — you know we were all one color, that kind of stuff. But I would say, why don't you let that be and do your own West Side Story, which may be what he's planning. Before we end, can I have a fan boy moment? I'm going to speak for an entire generation of Latino baby boomers who have been enthralled by Rita Moreno. Your beauty, your grace, your humor, screen presence and your joy. It has always been such an inspiration for me and so many others. So I want to take this opportunity while sitting across from you to thank you for all of your work. Your sacrifices, the way you've stood up for us. The way you celebrate our collective Latino cultures in your life and in your work. Thank you. You're going to make me cry. I appreciate the love. Thank you. In the 1970s and '80s, the TV show One Day at a Time pushed boundaries with the story of a divorced mother raising two teenage daughters in Indianapolis. Now Netflix has rebooted the show, and their 21st-century take pushes boundaries in its own way: The family is now Cuban-American, they live in Los Angeles and its mom, Penelope, is a veteran who served in Afghanistan. To some, he’s “That Guy” on “That Show.” But to those in the know—a number that’s growing every day—Stephen Tobolowsky is not only a great character actor (known for Ned Ryerson in "Groundhog Day," and now on "Silicon Valley" and the rebooted "One Day At A Time"), but a writer and storyteller whose podcast, “The Tobolowsky Files,” has touched the lives of countless listeners.